Hi, I am Mohammed Abdul Khader. After completion of my MBA in Marketing and MA in Mass Communication in India, I came to Saudi Arabia and entered the creative industry. I have been working with IEC Abroad since 2013. 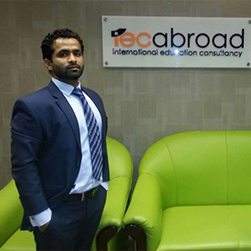 I look after IEC Abroad, Riyadh – Saudi Arabia branch. As a branch manager it requires so much more than quantitative skills or the ability to crunch numbers. I also possess strong sales, people-management and customer-service skills, because a branch manager’s responsibilities include developing and maintaining a good relationship with customers and employees. The best part of my job is that I get to meet different people from different countries and cultures. My main role includes taking care of the IEC team in Riyadh as well as contact with our partners in UK, USA and Canada. I love cricket, driving modified Bikes and swimming.